The Performance Advantages of the Auto-Clutch: Faster Corners, Quicker Lap Times, and Better Starts. Plus it virtually eliminates stalling. Rekluse Auto-Clutches make it easier to ride and easier to go fast. Ride one today and experience what the Clutch rEvolution is all about. The CoreManual clutch is made from hard anodized billet aluminum components, and is a professional grade manual clutch that offers superior durability and reliability over stock components. Superior oil flow, lighter but stronger components and optimized spring locating to eliminate binding provides a high performing clutch with smooth and consistent lever action. For even MORE performance, and the best manual clutch available, period. 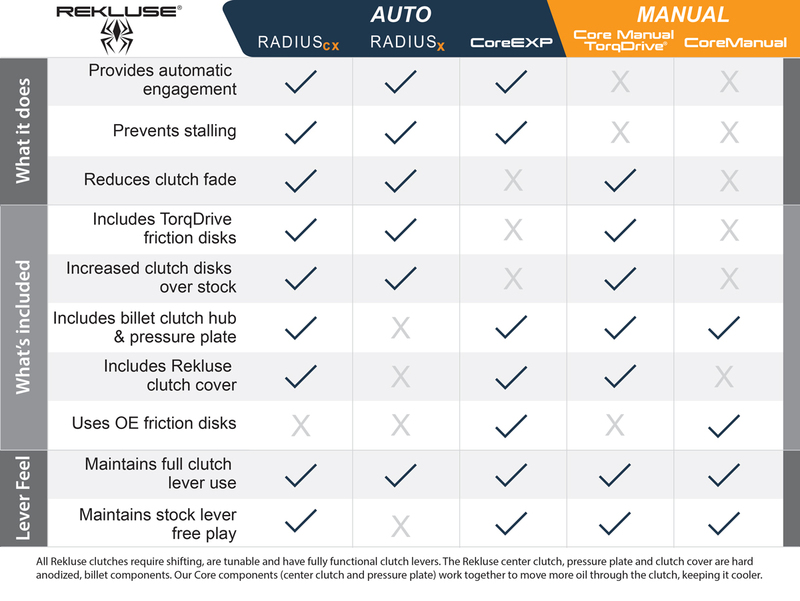 CoreManual TorqDrive delivers unprecedented performance, tuning and durability. TorqDrive provides more disks in less space, allowing us to add up to 4 additional frictions disks over stock. More frictions = more torque capacity thus unlocking the full power of your engine without the need to add stiffer pressure plate springs. Proven in racing at the highest levels, it’s not just good, it’s rEvolutionary.